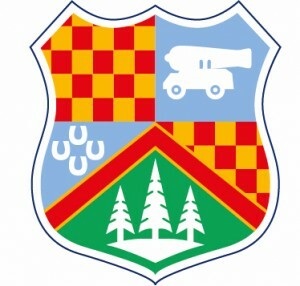 The badge was designed by Martin Cutler in 1979. The design was submitted to and reviewed by the committee of the College of Arms who recommended that the badge be retained exactly as it was designed, and so any replica should adhere strictly to the original registered description. The chequerboard squares come from the 10-year shirts. The cannon represents the gun on the Green in Chobham High Street. The original cannon were presented to the village by Queen Victoria following a Review of her troops on Chobham Common to celebrate her Jubilee.That cannon was requisitioned during WW2 and melted down. After the war the village replaced it with the present day replica. The 4 horse shoes is the sign of the pub on Windsor Road where the idea of a rugby club in Chobham was first discussed by the founder members. The fir trees were a noted landmark on Chobham Common, known as Chobham Clump – until someone cut them down just over 10 years ago. The striped chevron reminds us of the club’s original hooped shirts. Scarlet and gold were the club’s playing strip for many years and taken from the Courage Brewery which has supplied the club’s beer. Sky blue was the playing strip of the PAs, a 4th team whose concept was the same as tody’s Devils, i.e. experienced players with 16 and 17 year olds to introduce the young to senior rugby. Green was the very first playing strip before being replaced by the hoops and was the colour of the first club tie. Martin joined the club in 1974 when he took a position in the Front Row Union. He went on to preside over the Martyrs during which time he not only designed the club’s badge but also the Martyrs’ ” ugly, fat player ” badge. In the 1970s conditions behind the Iron Curtain were abysmal and Romania was just emerging as a rugby playing nation, but with very little in the way of facilities or equipment. Martin had a good friend in Romania dying of cancer who he wanted to visit so he decided to try to help Romanian rugby at the same time. He persuaded CRFC members to donate old kit, especially boots. The club also donated 2 Gilbert balls to the Romanian Under 21’s and sent a CRFC shield. During this period Martin also gave his time voluntarily to coach the Romanian Forwards for their International match against a France XV which they won convincingly. For his help with the under 21’s team Martin was made an Honorary Romanian Official and presented with a Romanian International Tie.